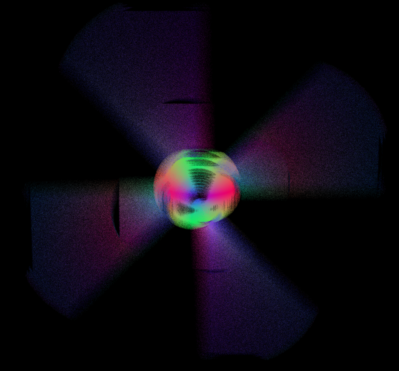 My raytracer supports a wide variety of objects. To intersect them, I use the standard technique of transforming rays into object-space. This works fantastically until I add motion blur. I model motion blur as a sequence of transforms (to simplify discussion, let's say exactly two) instead of one. My approach is to take the inverse transform of the ray at both keyframes and lerp the positions/directions. Some problems are due to the BVH breaking (it assumes the extrema of objects lie at keyframes), but even a brute force render is incorrect. I can fix all this by doing forward transforms only (transform object, not the ray), but this only works for objects where that is possible (only triangles, really). How can I make my raytracer produce linear approximations to transformation (especially rotation) by transforming rays, not objects? Lerping the ray positions/directions between keyframes should be equivalent to lerping the inverse matrices between keyframes and transforming by the lerped matrix. Trouble is, if the keyframes have different rotations, that lerped matrix will in general be something "weird", with shearing, nonuniform scale, etc. This is just a guess, but it might work better if you choose an interpolation method where the translation, rotation, and scale (if applicable) are lerped separately (using quaternions for the rotation part) and re-combined. I don't think you'll get terribly far with, AFAICS, a single linear approximation to a rather non-linear interpolation, but perhaps this paper / presentation by Gribel et al on motion blur in rasterisation may help. Not the answer you're looking for? Browse other questions tagged raytracing transformations motion or ask your own question.